The Aged Accounts section of the Executive Dashboard provides a breakdown of all of the unpaid fees owed to you by your families divided into time buckets for 0-30, 31-60, 61-90 and >90 days. Fees begin to age from their transaction date. Use this information to assist you with your Accounts Receivable collection efforts. See Aged Accounts (Who Owes you Money - Summary) for more information. Fees posted with a future date are not included in the Aged Account totals because they are not past due. The totals in the time bucket columns represent the total of unpaid fees on a family's account. This may or may not be the actual balance owing on the family's account depending on whether or not they have any unapplied credits. The sum of all unpaid fees on an account less any unapplied credits will equal the family balance. The Total column is the sum of all of the time bucket totals. The only accounts whose unpaid fees are pulled into these totals are accounts with a balance greater than $1. The assumption is made that your collection efforts are concentrated on families that owe you money. To look at ALL accounts go to the Reports menu and select the Aged Accounts report. Clear the Balance From and To fields and submit. You will now be able to see all unpaid fees including those on accounts with zero or credit balances. The Balance column is the sum of all of your family account balances and includes fees with a date in the future AND unapplied credits. 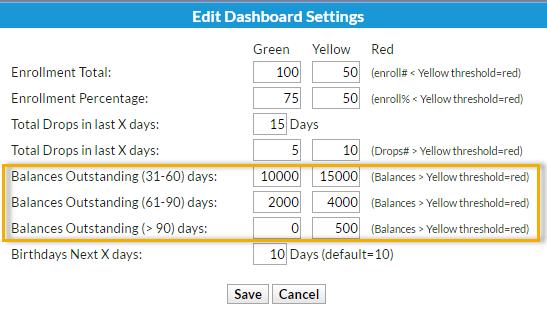 To give a quick visual of the overall 'health' of your accounts, customize your Aging Totals to color code them (green, yellow, red) by clicking the Settings link. The higher your billing is, the higher your past due amounts will likely be. If you are a smaller organization, then the thresholds will be lower. The 0 - 30 column is not able to be color coded as these amounts are considered 'current'. 31-60 days column - If the sum of all aged fees in this group is $10,000 or less the box will be shaded green. If that total is between $10,000 - $15,000 the column will change to yellow. When the total of all aged fees in this group exceeds $15,000 the column will be shaded red. 61-90 days column - If the sum of all aged fees in this group is $2,000 or less the box will be shaded green. If that total is between $2,000 - $4,000 the column will change to yellow. When the total of all aged fees in this group exceeds $4,000 the column will be shaded red. >90 days column - If the sum of all aged fees in this group is $0 the box will be shaded green. If that total is between $0 - $500 the column will change to yellow. When the total of all aged fees in this group exceeds $500 the column will be shaded red. It is important to note that improper linking of fees and payments will affect these aging totals. If a fee has been paid but a payment has not been linked to it, it will be included in the Aged Account totals because Jackrabbit still sees the fee as unpaid. See Fee Linking Explained for more information.